Barack Obama's Campaign wants to make his Super Tuesday victory official. Campaign Manager David Plouffe says that Obama won 9 more delegates than Hillary Clinton on Tuesday, based on a pledged delegate estimate conducted overnight by analysts in the campaign's Chicago "boiler room." Obama won 845 delegates to Clinton's 836, according to Obama's data team, which includes Democratic targeting buff Ken Strasma and delegate expert Jeff Berman, who caused the AP to reverse its Nevada delegate estimate a few weeks back. "By winning a majority of delegates and a majority of the states, Barack Obama won an important Super Tuesday victory over Senator Clinton in the closest thing we have to a national primary," Plouffe told reporters on Wednesday. Senior Clinton strategists depicted Clinton as an energized underdog in a media conference call on Wednesday, contending that voters are rejecting Obama's "establishment" campaign. Barack Obama’s Campaign wants to make his Super Tuesday victory official. Campaign Manager David Plouffe says that Obama won 9 more delegates than Hillary Clinton on Tuesday, based on a pledged delegate estimate conducted overnight by analysts in the campaign’s Chicago "boiler room." 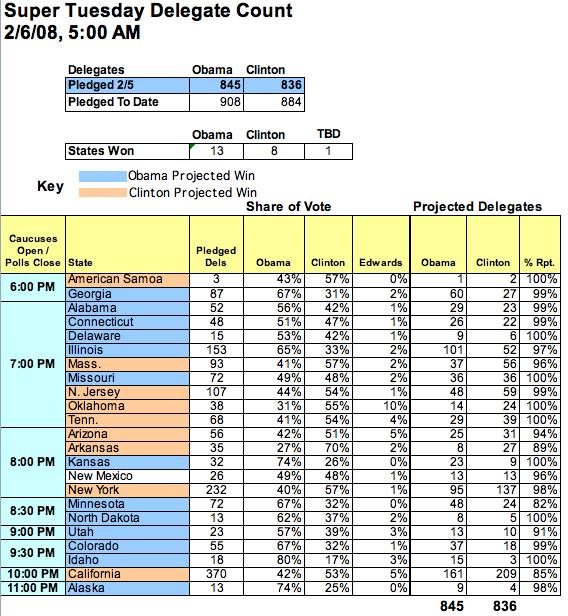 Obama won 845 delegates to Clinton’s 836, according to Obama’s data team, which includes Democratic targeting buff Ken Strasma and delegate expert Jeff Berman, who caused the AP to reverse its Nevada delegate estimate a few weeks back. "By winning a majority of delegates and a majority of the states, Barack Obama won an important Super Tuesday victory over Senator Clinton in the closest thing we have to a national primary," Plouffe told reporters on Wednesday. Senior Clinton strategists depicted Clinton as an energized underdog in a media conference call on Wednesday, contending that voters are rejecting Obama’s "establishment" campaign. The Clinton Campaign has not released its own estimate, so Obama’s spreadsheet may be all we have to go on for a while. These numbers refer to Super Tuesday only — not to the total count of delegates from prior states or the party’s mercurial, "elite contingent" of superdelegates.